The Government of Canada remains firmly committed to working with the Atlantic Provinces to take bold action – under the Atlantic Growth Strategy (AGS) – to create good-paying, middle class jobs, strengthen local communities, and grow the economy. The AGS has five pillars: Skilled Workforce and Immigration, Trade and Investment, Innovation, Clean Growth and Climate Change, and Infrastructure. 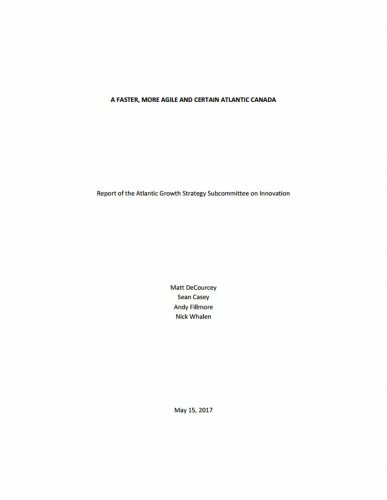 In connection with the Innovation pillar of the AGS, the Federal Liberal Atlantic Caucus appointed an Innovation Subcommittee (the Subcommittee) comprised of Matt DeCourcey - MP Fredericton (Chair), Sean Casey - MP Charlottetown, Andy Fillmore - MP Halifax, and Nick Whalen - MP St. John’s East. The mandate of the Subcommittee is to propose meaningful and measurable action in the form of pilot programming or projects, and to recommend changes to existing programs, in both rural and urban areas, with the goal of fostering economic growth under the Innovation pillar under the AGS. The Subcommittee held public and private consultations with stakeholders from each of the four Atlantic Provinces in Fredericton, Moncton, Charlottetown, Halifax and St. John’s.